Diabetes mellitus (DM) is a group of metabolic diseases defined by high blood glucose levels, which, depending on the fasting blood glucose, may be pre-diabetes or overt diabetes (110 mg/dl. 124 mg/dl). This blood glucose level reflects a disorder of control of glucose metabolism, which is mediated through the pituitary growth hormone acting on the liver, which produces insulin growth factor 1 (IGF1). Diabetes is due to either the pancreas not producing enough insulin, or the cells of the body not responding properly to the insulin produced. That said, there is much to be understood about the long term systemic effects of this disorder, a multisystem disease. The presence of pre-diabetes glucose levels is sufficient to proactively take measures to reduce the circulating glucose. The observation of symptoms of frequent urination, increased thirst, and increased hunger is symptomatic of overt DM, and is seen with diabetic ketoacidosis, with very high hyperglycemia and glucosuria, particularly in Type 1 DM. Untreated, diabetes leads to serious complications. Acute complications include diabetic ketoacidosis. Serious long-term complications include heart disease, stroke, kidney failure, foot ulcers and damage to the eyes. Type 1 DM results from the body’s failure to produce enough insulin. This form was previously referred to as “insulin-dependent diabetes mellitus” (IDDM) or “juvenile diabetes”. The cause is unknown. Gestational diabetes, the third, occurs when pregnant women without a previous history of diabetes develop a high blood glucose level. Gestational diabetes is perhaps Type 2 diabetes in a pregnant woman initiated by the condition of pregnancy. Whether these women were not diabetic, with a glucose level between 100-110 prior to pregnancy, is an open question. However, the pregnant state is accompanied by large effects by hormone levels. Type 2 diabetes has been increasing worldwide, not only in western nations. However, in non-western countries that have large populations of underserved, there is still a major problem with protein energy malnutrition (PEM). Globally, as of 2013, an estimated 382 million people have diabetes worldwide, with type 2 diabetes making up about 90% of the cases. This is equal to 8.3% of the adults population, with equal rates in both women and men. Worldwide in 2012 and 2013 diabetes resulted in 1.5 to 5.1 million deaths per year, making it the 8th leading cause of death. Diabetes overall at least doubles the risk of death. The number of people with diabetes is expected to rise to 592 million by 2035. The economic costs of diabetes globally was estimated in 2013 at $548 billion and in the United States in 2012 $245 billion. The major long-term complications relate to damage to blood vessels. Diabetes doubles the risk of cardiovascular disease and about 75% of deaths in diabetics are due to coronary artery disease. Other “macrovascular” diseases are stroke, and peripheral vascular disease. The primary microvascular complications of diabetes include damage to the eyes, kidneys, and nerves. Damage to the eyes, known as diabetic retinopathy, is caused by damage to the blood vessels in the retina of the eye, and can result in gradual vision loss and potentially blindness. Damage to the kidneys, known as diabetic nephropathy, can lead to tissue scarring, urine protein loss, and eventually chronic kidney disease, sometimes requiring dialysis or kidney transplant. Damage to the nerves of the body, known as diabetic neuropathy, is the most common complication of diabetes. A number of articles in http://pharmaceuticalintelligence,com (this journal) have presented the relationship of DM to heart and vascular disease. The complexity of the disease is not to be underestimated, and there havr been serious controversies with adverse consequences over the use of the class of drugs that includes rosiglitazone and piaglitazone, which has opened serious issues about how clinical trials are conducted, and how the data obtained in studies may be compromised. Management of Diabetes Mellitus: Could Simultaneous Targeting of Hyperglycemia and Oxidative Stress Be a Better Panacea? The primary aim of the current management of diabetes mellitus is to achieve and/or maintain a glycated hemoglobin level of ≤6.5%. However, recent evidence indicates that intensive treatment of hyperglycemia is characterized by increased weight gain, severe hypoglycemia and higher mortality. Besides, evidence suggests that it is difficult to achieve and/or maintain optimal glycemic control in many diabetic patients; and that the benefits of intensively-treated hyperglycemia are restricted to microvascular complications only. Evidence also indicates that multiple drugs are required to achieve optimal glycemic target in many diabetic patients. In fact, in many diabetic patients in whom optimal glycemic goal is achieved, glycemic control deteriorates even with optimal drug therapy. It does suggest that with the current hypoglycemic or antidiabetic drugs, it is difficult to achieve and/or maintain tight glycemic control in diabetic patients. In many developing countries, the vast majority of diabetic patients have limited or lack access to quality healthcare providers and good therapeutic monitoring. While increased weight gain could be due to some component drugs (such as sulphonylureas or insulin) of the intensive therapy regimens, hypoglycemia could be drug-induced or comorbidity-induced. Considering the evidence that associates hypoglycemia with increased mortality, higher incidence of mortality in intensive therapy group could be due to hypoglycemia or too low levels of glycosylated hemoglobin. However, it is difficult to contend that increased mortality was entirely due to hypoglycemia. The possibility of drug-induced or drug-associated toxicities could not be ruled out. For instance, rosiglitazone, which has been prohibited and withdrawn from the market in Europe, was one of the hypoglycemic drugs used to achieve intensive therapy of hyperglycemia in Action to Control Cardiovascular Risk in Diabetes (ACCORD). If these findings are anything to go by, does it not suggest that targeting hyperglycemia as the only therapeutic goal in the management of diabetes mellitus could be detrimental to diabetic patients? In addition, the current hypoglycemic drugs are characterized by limitations and adverse effects. Together with the limitations of intensive glycemic treatment (only beneficial in reducing the risk of microvascular complications, but not macrovascular disease complications), does it not imply that targeting hyperglycemia alone is not only deleterious but also limited and ineffective? The latest figures predict that the global incidence of diabetes mellitus, which was estimated to be 366 million in 2011, will rise to 522 million by 2030. In view of these frightening statistics on the prevalence of diabetes mellitus and on the lack of adequate healthcare, together with the associated diabetic complications, morbidity and mortality, does it not suggest that there is an urgent need for a better therapeutic management of this disorder? Taken together, with these findings and statistics, it can be contended that it is high time alternative and/or complementary therapies to the currently available hypoglycemic agents (which target primarily hyperglycemia only) were sought. this commentary proposes a hypothesis that “simultaneous targeting of hyperglycemia and oxidative stress” could be more effective than “intensive treatment of hyperglycemia” in the management of diabetes mellitus. an “imbalance between oxidants and antioxidants in favor of the oxidants, potentially leading to damage”. hyperglycemia-activated Poly-ADP ribose polymerase (PARP) pathway. These pathways are activated or enhanced by hyperglycemia-driven mitochondrial superoxide overproduction. unlike other diseases characterized by oxidative stress, diabetes mellitus is unique. Its cure (restoration of euglycemia, e.g., via pancreas transplants) does not prevent oxidative stress and diabetic complications. This is very important because hyperglycemia exacerbates oxidative stress which is linked to diabetic complications. Theoretically, restoration of euglycemia should prevent oxidative stress and diabetic complications. However, this is not the case. At present, it remains unclear why restoration of euglycemia does not automatically prevent oxidative stress and diabetic complications. The development of diabetes-related complications (both microvascular and macrovascular) may occur in diabetic patients after normoglycemia has been restored. It is a phenomenon whereby previous hyperglycemic milieu is remembered in many target organs such as heart, eyes, kidneys and nerves. This phenomenon is also documented in diabetic animals. Compelling evidence implicates the role of oxidative stress as an important mechanism by which glycemic memory causes tissue damage and diabetic complications. In view of higher incidence of diabetic complications (of which oxidative stress plays an important role) in conventionally-treated diabetic patients, targeting oxidative stress in these patients might be beneficial. In other words, it is possible that the combination of a conventional therapy of hyperglycemia and antioxidant therapy might be more effective and beneficial than intensive therapy of hyperglycemia alone, which is the gold standard at the moment. by cleaving angiotensin II (AII) into angiotensin 1–7 (A1–7). endogenous ACE2 in maintaining insulin sensitivity. in ACE2KO mice than in their wild-type (WT) littermates. but was eradicated by A1–7 or an AT1 blocker combined with the A1–7 inhibitor (A779). was dramatically reduced in the skeletal muscles of the standard diet–fed ACE2KO mice. decreased by A779 in WT mice. ACE2 protects against high calorie diet-induced insulin resistance in mice. This mechanism may involve the transcriptional regulation of GLUT4 via an A1–7-dependent pathway. defined as the metabolic syndrome. anti-hypertensive drugs that block the RAS (renin–angiotensin system) may also act to prevent diabetes. Despite its long history, new components within the RAS continue to be discovered. opposing many of the AngII-related deleterious effects. insulin and Ang-(1–7) share a common intracellular signalling pathway. as a very attractive strategy in the therapy of the metabolic syndrome and diabetes-associated diseases. a reduction in capillary density (CD) may worsen insulin sensitivity. may be modifiable through aerobic exercise training and weight loss (AEX+WL). Insulin sensitivity (M) and 120-min postprandial glucose (G120) correlated with CD at baseline (r = 0.58 and r = 20.60, respectively, P < 0.05). AEX+WL increased maximal oxygen consumption (VO2max) 18%(P = 0.02) and reduced weight and fat mass 8% (P < 0.02). as well as the decrease in G120 (r = 20.55, P < 0.05). AEX+WL increases skeletal muscle CD in older adults with IGT. This represents one mechanism by which AEX+WL improves insulin sensitivity in older adults with IGT. Glycaemic durability with dipeptidyl peptidase-4 inhibitors in type 2 diabetes: a systematic review and meta-analysis of long-term randomised controlled trials. K Esposito, P Chiodini, MI Maiorino, G Bellastella, A Capuano, D Giugliano. BMJ Open 2014;4:e005442. of differences were not affected by the analysis of six extension trials (0.24%, 0.02 to 0.46), or five trials in which a DPP-4 inhibitor was added to metformin (0.24%, 0.16 to 0.32). The effect of DPP-4 inhibitors on HbA1c in type 2 diabetes significantly declines during the second year of treatment. The over-arching biomarker that has more to do with the ability to restore normal metabolic processes is in achieving a cellular pH 7.45 (via the Kreb’s Cycle). To say the least, getting one’s cellular pH to 7.45 and A1C score below 6.0 can be a daunting task! regeneration of β-cells of pancreas in diabetic rats. Histopathological studies support the healing of pancreas by hydro alcoholic extracts (HAE1& HAE2) of Nardostachys Jatamansi, as a probable mechanism of their antidiabetic activity. Antidiabetic and Antihyperlipidemic Effect of Parmelia Perlata. Ach. in Alloxan Induced Diabetic Rats. liver glycogen levels in alloxanized rats. were also altered in diabetic rats. reduced the fasting blood glucose and HbA1C level and increased the level of plasma insulin. reducing serum triglyceride, cholesterol, LDL, VLDL, free fatty acids, phospholipids and increasing the HDL level in a dose dependent manner. The effects of leaf extract were compared with standard drug glibenclamide (600μg/Kg bw). The results indicate that Parmelia perlata. Ach., Linn. could be a good natural source for developing an antidiabetic drug that can effectively maintained the blood glucose levels and lipid profile to near normal values. Copyright: (c) 2003-2012, PathologyOutlines.com, Inc.
Acellular, homogeneous, eosinophilic, globular nodules in the mesangial orintercapillary region of a glomerular tuft with capillary displaced to the periphery. 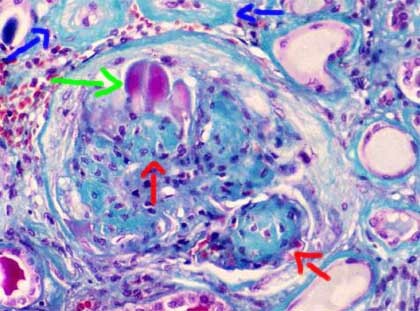 Diffuse intercapillary glomerulosclerosis: increasing eosinophilic mesangial matrix materials. Capsular drop: eosinophilic small nodules on Bowman’s capsule. Fibrin cap: eosinophilic, waxy, fatty structure within the lumen of one or more capillary loops of glomerular tufts. Islet amyloid polypeptide, islet amyloid, and diabetes mellitus. Westermark P1, Andersson A, Westermark GT. aggregate into insoluble amyloid fibrils, features typical of islets of most individuals with type 2 diabetes. but the molecule also has regulatory properties in normal physiology. In addition, it possibly contributes to the diabetic condition. This review deals with both these facets of IAPP. both locally in the islets, where it inhibits insulin and glucagon secretion, and at distant targets. It has binding sites in the brain, possibly contributing also to satiety regulation and inhibits gastric emptying. Effects on several other organs have also been described. which are seen particularly in association with type 2 diabetes in humans and with diabetes in a few other mammalian species, especially monkeys and cats. including mechanisms whereby human IAPP forms toxic aggregates and amyloid fibrils. and islet deposits were found to share this appearance. it was suspected that the islet deposits might also be a polymerized protein. insulin, or proinsulin, or split products thereof constitute the islet amyloid fibrils. but with partial identity to the neuropeptide calcitonin gene-related peptide (CGRP). Further characterization of the peptide purified from an insulinoma and from islet amyloid of human and feline origin proved it to be a 37-amino acid (aa) residue peptide. The peptide was initially named “insulinoma amyloid peptide” , later diabetes-associated peptide (DAP), and finally islet amyloid polypeptide (IAPP), or “amylin”. 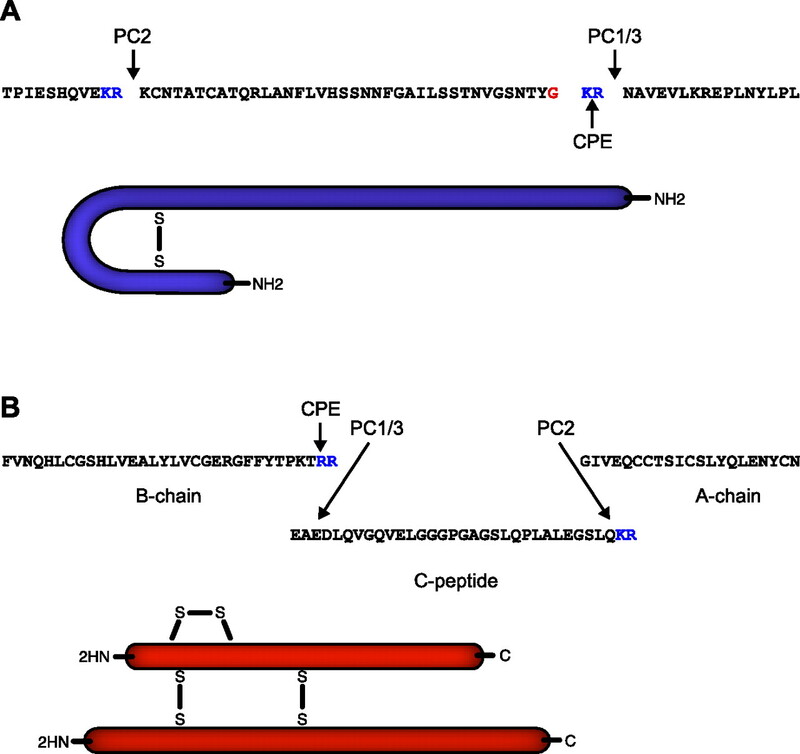 two short flanking peptides, the latter cleaved off at double basic aa residues similar to proinsulin. all of which are encoded by genes on the evolutionary related chromosome 11.
the last two encode the full prepromolecule. conversion of proIAPP to IAPP takes place in the secretory vesicles. by carboxypeptidase E (CPE) (Figure 1). A: the amino acid sequence of human pro-islet amyloid polypeptide (proIAPP) with the cleavage site for PC2 at the NH2 terminus and the cleavage site for PC1/3 at the COOH terminus, indicated by arrows. The KR residues (blue) that remain at the COOH terminus after PC1/3 processing are removed by carboxypeptidase E. This event exposes the glycine residue that is used for COOH-terminal amidation. Below is a cartoon of IAPP in blue with the intramolecular S-S bond between residues 2–7 and the amidated COOH terminus. B: the amino acid sequence of human proinsulin with the basic residues at the B-chain/C-peptide junction and the A-chain/C-peptide/junction indicated in blue and the processing sites indicated by arrows. PC1/3 does almost exclusively process proinsulin at the B-chain/C-peptide junction while PC2 preferentially processes proinsulin at the A-chain/C-peptide junction. The basic residues (RR) (position 31, 32) that remain at the COOH terminus of the B-chain is removed by the carboxypeptidase CPE. Below is a cartoon of insulin A-chain and B-chain in red with intermolecular SS bonds between cystein residues 7 in the A and B chains, between cystein residues at position 19 in the B-chain and 20 in the A-chain and the intermolecular SS bond between cystein residues at position 6 and 11 of the A-chain. and the transcription factor PDX1 regulates the effects of glucose on both genes. Glucose stimulated β-cells respond with a parallel expression pattern of IAPP and insulin in the rat. high doses of streptozotocin or alloxan reduced insulin secretion more than that of IAPP. Oleat and palmitate increased the expression of IAPP but not of insulin in MIN6 cells. In mice fed a diet high in fat for 6 mo, plasma IAPP increased 4.5 times more than insulin compared with mice fed standard food containing 4% fat. more IAPP than normal secreted during hyperglycemia. These examples show that the strictly parallel expression of IAPP and insulin may be disturbed under certain conditions. The crystalline structure of insulin in granules is well characterized. IAPP, together with a large number of additional components, including the C peptide, is found in the halo region. The highly fibrillogenic human IAPP has to be protected in some way from aggregation, which otherwise would take place spontaneously. The fact that very fibril-prone proteins can be kept in solution at high concentrations is known from studies of arthropod silk. The composition of the β-cell granule is extremely complex, and it has many components in addition to insulin and C peptide, in micromolar concentrations. proinsulin, insulin, or their processing intermediates. a strong inhibitor of IAPP fibril formation. which binds specifically to a short segment of IAPP. An insulin-to-IAPP ratio of between 1:5 and 1:100 had a strong inhibitory effect. The molar ratio between IAPP and insulin in the granule as a whole is ∼1–2:50.
in a population-based cohort of 2,574 Japanese-American men enrolled in the Honolulu-Asia Aging Study, including 216 subjects who underwent autopsy. Type 2 diabetes was ascertained by interview and direct glucose testing. Dementia was assessed in 1991 and 1994 by clinical examination and magnetic resonance imaging and was diagnosed according to international guidelines. Logistic regression was used to assess the RR of developing dementia, and log-linear regression was used to estimate the incident rate ratio (IRR) of neuropathological outcomes. vascular dementia (VsD; 2.3 [1.1–5.0]). had an RR of 5.5 (CI 2.2–13.7) for AD compared with those with neither risk factor. they had a higher risk of cerebral amyloid angiopathy (RR 6.6, 1.5–29.6). Type 2 diabetes is a risk factor for AD and VsD. The association between diabetes and AD is particularly strong among carriers of the APOE ε4 allele. The neuropathological data are consistent with the clinical results. but also the central system with impaired learning, memory and mental flexibility. only the C57BL6 mice showed statistically significant hyperglycemia. neither C57BL6 nor Swiss Webster mice fed a HFD showed signs of defects at that time point. whereas their peripheral nervous system remained normal. but showed normal learning and memory functions. and only in Swiss Webster mice. In addition to insulin impairment, dyslipidemia or adiponectinemia might determine the neuropathy phenotype. S Srodulski, S Sharma, AB Bachstetter, JM Brelsfoard, et al. contains deposits of amylin, an amyloidogenic hormone synthesized and co-secreted with insulin by pancreatic β-cells. chronic hypersecretion of amylin (hyperamylinemia), which is common in humans with obesity or pre-diabetic insulin resistance. contributes to the development of T2D. Here, we tested the hypothesis that accumulation of oligomerized amylin affects brain function. rodent amylin is neither amyloidogenic nor cytotoxic. which express only wild-type (WT) non-amyloidogenic rodent amylin. Cage activity, rotarod and novel object recognition tests were performed on animals nine months of age or older. Amylin deposition in the brain was documented by immunohistochemistry, and western blot. We also measured neuroinflammation by immunohistochemistry, quantitative real-time PCR and cytokine protein levels. iii) no ability to improve the performance on the rotarod. associated with amylin accumulation in the brain. is almost double in HIP rats compared with WT littermates (P < 0.05). alters the brain structure at the molecular level. are clustering in areas positive for amylin infiltration. amylin deposition in the brain induces a neuroinflammatory response. leading to neurological deficits through an oligomerized amylin-mediated inflammatory response. whether brain amylin accumulation may predispose to diabetic brain injury and cognitive decline.